Today the Fairfax at Embassy Row is an approachable and upscale historic gem with recent modernizations. Guests are sure to appreciate the openness of the multi-functional common areas and the classic ambiance, which gives the hotel a brand new appeal to established and growing business professionals, diplomatic and international guests, and Washington, D.C. locals as well. Choose to work quietly by the fireplace in any of these common spaces or join a group conversation. Enjoy one of the 259 elegantly appointed sleeping rooms. Mix and mingle in The Sally, the cocktail-centric small-plates restaurant or stop by The Market for grab and go fare or a locally-sourced cup of coffee. 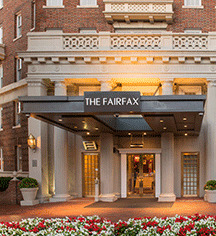 It is all about the convenience, ease and elegance at The Fairfax at Embassy Row. The Fairfax at Embassy Row, a member of Historic Hotels Worlwide since 2016, dates back to 1927.